Image of the sun taken by the Solar Dynamics Observatory. Credit: NASA. (Phys.org) -- The sun is nearly the roundest object ever measured. If scaled to the size of a beach ball, it would be so round that the difference between the widest and narrow diameters would be much less than the width of a human hair. The sun rotates every 28 days, and because it doesn't have a solid surface, it should be slightly flattened. This tiny flattening has been studied with many instruments for almost 50 years to learn about the sun's rotation, especially the rotation below its surface, which we can't see directly. Now Jeff Kuhn and Isabelle Scholl (Institute for Astronomy, University of Hawaii at Manoa), Rock Bush (Stanford University), and Marcelo Emilio (Universidade Estadual de Ponta Grossa, Brazil) have used the Helioseismic and Magnetic Imager (HMI) onboard the Solar Dynamics Observatory satellite to obtain what they believe is the definitive -- and baffling -- answer. Because there is no atmosphere in space to distort the solar image, they were able to use HMI's exquisite image sensitivity to measure the solar shape with unprecedented accuracy. The results indicate that if the Sun were shrunk to a ball one meter in diameter, its equatorial diameter would be only 17 millionths of a meter larger than the diameter through its North-South pole, which is its rotation axis. They also found that the solar flattening is remarkably constant over time and too small to agree with that predicted from its surface rotation. This suggests that other subsurface forces, like solar magnetism or turbulence, may be a more powerful influence than expected. Kuhn, the team leader and first author of an article published today in Science Express, said, "For years we've believed our fluctuating measurements were telling us that the sun varies, but these new results say something different. While just about everything else in the sun changes along with its 11-year sunspot cycle, the shape doesn't." This work was supported by NASA grants to Stanford University and the University of Hawaii. "The sun rotates every 28 days, and because it doesn't have a solid surface, it should be slightly flattened. " obviously you are full of dogma and not science. "This work was supported by NASA grants "
Perhaps the lack of an equatorial bulge is due to the balance between gravity and fusion pressure. It's because there is immense pressure, both outward and inward, and this pressure completely dominates any centrifugal force. I'm willing to bet it is ever so slightly elongated as expected, but the degree of this is tiny because the competing pressures of gravitational collapse and the explosive energy of the sun force it into a sphere so strongly that this dwarfs the centrifugal force. My bet is on internal turbulence/radiation pressure as the mechanism for redistributing force uniformly to offset rotational oblation. It may be so - the Sun exhibits gravitational brightening at poles, being slightly hotter there and the increased pressure of radiation counterfeits the gravity. In this case the word "should" doesn't mean that there's something wrong with the sun. It means that our knowledge is faulty. When the word "should" is used in this way, it means that the real sun is different from the theoretical sun that we get with the faulty calculations that we can currently make, based on our incomplete current knowledge. It means that the real sun is different from the way it would be if our knowledge were accurate. So, it means that there's something wrong with our current knowledge. When the word "should" is used in this way, it means that there's something we don't know, something we need to explore. And they are doing just that. They are exploring this enigma, trying to find the missing knowledge. That is the scientific approach. they are taught "it should be slightly flattened" yet the sun is not. Why this dogma is not science? It is assumed the sun should be slightly flattened yet is not. Science is about observation not academic assumptions ergo dogma. Yes my friends there is dogma in science. "IV. THE SUN IS A "CLOTHED NEUTRON STAR" formed by accreting iron-rich material on the pulsar (spinning neutron star) made at the supernova core"
Whatever happened to him? Chain gang? 1. If we calculate, then our result is a more flattened sun. 2. But the real sun is not as flattened as our calculation says. 3. This means that our calculation is wrong. What happens is that they use mathematics. These mathematics give the correct result in almost all known cases. But in the case of the sun, the math does not work right. They are taught math that works right for almost all known cases. They are _also_ taught that their math is wrong in the case of the sun. They know that it is wrong. They don't hide this. They don't deny it. They know it. You need to learn English expressions better. You need to learn what the English word "should" means when it is used in this way. It means that they acknowledge that their math is wrong. 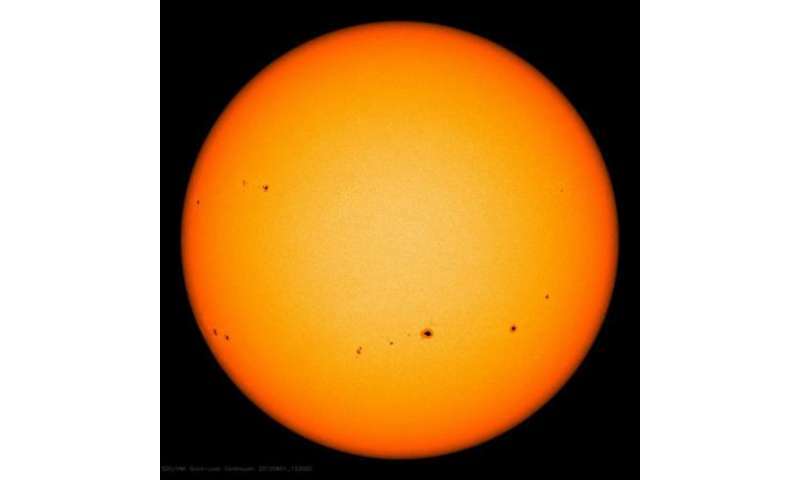 "Sun's constant size surprises scientists"
"Space observations of Mercury transits yield precise solar radius"
"The Sun's almost perfectly round shape baffles scientists"
The earth, made up of much denser materials than the sun, is also quite flat. An orange skin has deeper/higher points relative to its diameter than the earth. Why should the sun, a ball of gas, be any rougher? "Why should the sun, a ball of gas, be any rougher?" Look at Jupiter, mostly a ball of H2. It's not round, quite oblate because of its rotation. The sun rotates far slower but doesn't show even the small oblate shape expected by pure Newtonian mechanics so scientists need to find what else is going on. "And in 2003, astronomers discovered the equatorial diameter of the blue B3 main sequence star Achernar is 56% greater than its polar diameter, making it flattest star known." That there are mechanisms that can actively balance out the deviation from a sphere that hydrostatic balance sets up in a spinning body is surprising but not impossible. Most likely thermal convection sets up the "turbulence" they suggest somehow acts as such a feedback. The reason photon pressure is dominant to counteract gravity is interesting by the way. It is because stars are opaque and dense, so photons are trapped. It takes, IIRC, many 100 000s year for a photon to bounce its way up to the surface! (By a random walk in 3D.) Hence photon density in a star is immense, hence its pressure is dominated by photons. When supernovas happens, things can change. In some supernovas it is believed it is pair production, mainly of electron-positron pairs IIRC, that sets up the explosion pressure. How could the Sun have a neutron star inside it? Scientists can see through our transparent Sun so wouldn't they have noticed it? First of all I would like to open with a simple definition. Now that we have established the meaning of the word at hand, let us reference the source: "Why this dogma is not science? It is assumed the sun should be slightly flattened yet is not." Our friend here is suggesting that any established though regarding our natural world based on theory and mathematical equations that ends up being even slightly incorrect is by definition "dogma". Even when the same "people of authority" are actively taking part in studies to prove their "dogma" is NOT true. Dogma is supposed to be "incontrovertibly true". The very act of participating in this study eliminates any potential logical way of it being considering dogma. Please use the dictionary before posting, you make yourself look a fool. Maybe go drink some Gatorade, you need more electrolytes. It is, after all, what plants crave. Interesting results, esspessially in comparison with other stars which do flatten. I suppose the rotation is insufficient to overcome whatever forces tend to keep it spherical. I wonder for a given rotational period do larger or smaller stars flatten more? The magnetic field of the sun and thus the sun spots rotate in 28 days. Nobody really knows how fast the surface itself is actually moving. How could the Sun have a neutron star inside it? The neutron star is exaggerated concept (the density of Solar core is about 150 times greater than that of water, whereas the density of neutron star is higher in many orders of magnitude), but the neutrino flux is concentrated into small central area of Sun, where the conditions aren't so different from the surface of neutron stars. What's interesting, this core rotates about three to five times faster than the rest of Sun. I presume, it exhibits directional flux of neutrinos/dark matter, because it affects the decay of radioactive elements with corresponding frequency. In this sense the core of Sun may behave like small neutrino pulsar. nobody really knows how fast the surface itself is actually moving. Why the sunspots should rotate with different speed than the rest of surface? The sunspots are spatial vortices, which are embedded quite deeply into solar surface (they exhibit the Wilson effect) - so they should be dragged with it. Quite recently a new experimental evidence of the connection of radioactive decay to solar flares was given. It bring the questions for whole new physics. Not only we should explain, how the neutrinos can affect the speed of radioactive decay - they're too tiny and the flux of solar neutrinos is too sparse for it. But we should explain too, how the solar flares modulate the concentration of neutrinos. The flux of solar neutrinos is quite stable and it apparently doesn't contribute to this effect. My explanation is, The escape velocity of neutrinos from Sun is just slightly higher, than the speed of neutrinos, which are in thermal equilibrium with CMBR fluctuations. The solar flares therefore interact with cold neutrinos cumulated around the Sun and they're displacing it. Note that Sun generates normal neutrinos, whereas the antineutrinos are dominant in primordial dark matter. The interaction of neutrinos with solar flares is most probably related to this study. The charged particles in solar plasma are moving with relativistic speed and such the may interact with neutrinos with elevated cross-section through gravitational waves. The similar effects were conjectured for interaction of gravitational waves with (fast moving electrons within) superconductors. In my opinion the neutrinos are solitons of gravitational waves in similar way, like photons are solitons of gravitational waves, so they should be affected with fast moving charged electrons and ions of solar plasma too. It may take another twenty years, before these effects will be considered and tested experimentally with caution. Apparently Oliver claimswe can actually see the neutronium surface in pictures. Such is his deviation from the norm. explosive energy of the sun force it into a sphere so strongly that this dwarfs the centrifugal force. Centrifugal? no such force exists, although i agree that the apparent "smoothness" of the suns spherical shape is due to the balance of forces, i would also assume that the higher mass more spherical the shape becomes as the range where gravity becomes too weak to hold the "surface" of whatever we're discussing becomes smaller inversely proportional the mass ? perhaps ? Depending on your frame of reference, you do experience it as a force, and calculate on it as such, and name it as such. For example, in a spaceship that rotates to create a kind of artificial gravity, you experience a force that you can call gravitational or centrifugal or something else, depending on the viewpoint and frame of reference that you choose. There's also a "Coriolis force" that "doesn't exist" unless you're in the frame of reference where it "does exist". It's all a matter of frames of reference. You can't get physics right if you insist on only the "neutral" frame of reference, which is what you do if you insist on the myth. Our sun is indeed a very, very special star. This is attested to by its extraordinary stability where flares that might be dangerous to us are a complete non-occurrence, compared to other stars of the same size and brightness where such flareups occur regularly within a hundred years. We've NEVER experienced anything like it. Special indeed. So to find that it's almost completely circular/spherical should be no surprise; indeed one could almost certainly speculate that it's supreme stability is reflected in that perfect sphericity. We haven't seen a major impact or a supervolcano but we know they can happen. Evidence tells us this. Except Oliver's answer to everything is neutron repulsion, and Kevin's answer to everything is God. And why is that kev? Why would you conclude they are related when you have no idea what causes them? I suppose since your Jesus is a sun god that you might know something about it, but only in the same relative way as stability to roundness. The sun is not perfect kev. It has SPOTS. it flares up from time to time and spits stuff out. Would god create something that's ALMOST perfect? Does he tolerate only a certain amount of imperfection? Was the sun in fact perfect before the Fall, and sin gave it blemishes? I expect answers because I have follow-up questions. The facts seem to put a strain on extra-dimensional theories. All of them. A perfect 3-d structure. or 4-d if you choose to follow it through time. Reality is nice, beautiful even. Perfect circle string theorists? I think that being a sphere also causes it to be round-ish. I suspect that the reason for the extreme "roundness" of the Sun is due to the interaction of convection and gravity. The constant up & down movement of huge masses of material and the force of gravity are both perfectly symmetrical. The rotation of the Sun is probably too slow to have much of a bulging effect on the symmetry afforded by gravity & convection flows. Add photon pressure as a third symmetrical component. If there is a surface what is it - too hot for a liquid ? Sun has to be a reflector to Cosmic Pot Sphere. The sun is alive, sunspots are pimples (better watch out when that zit pops! ), and if it wants to be (almost) perfectly spherical it has every right to be. I'm going outside right now to beg forgiveness for - uh - something. So there you go. I understand this is why the number 666 is such an abomination - it is made up of sixes which are ALMOST the perfect godly number 7. A perfect god would hate almost-perfect, wouldnt he kevin? Kevin? Our sun is indeed a very, very special star. Its pretty special at producing skin cancer for millenia before & after Moses & after Jesus, prob why they were black. This is attested to by its extraordinary stability.. Yes, Sun is stable at producing cancers in many people for a long time..
Why didnt your god (at least) provide education ? Basic stuff! We've NEVER experienced anything like it. Special indeed. You mean you have ignored so much eg flares affecting satellites, power grids, people distracted by auroras in the north causing accidents ! So to find that it's almost completely circular/spherical should be no surprise..
'almost' kevinrtrs ! You saying your god is an anthropomorphic 'almost' deity ? Is that why it cant produce an indestructible bible to give to all 11 year old kids. Ooops it cant stop kids dying young all over the world can it, pathetic impotent deity indeed !